Stamford Bridge awaits as gameweek 3 sees Everton travel south to face Chelsea. 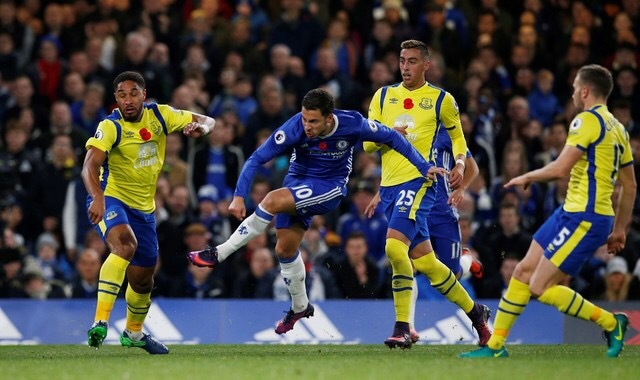 The last time these two teams met at The Bridge, Everton’s side was vastly different to that of the team that could line up tomorrow. Everton fielded the following players that have either left the club or are injured/not in favour: Martin Stekelenburg, Seamus Coleman, Bryan Oviedo, Ramiro Funes Mori, Gareth Barry, Tom Cleverley, Ross Barkley and Romelu Lukaku. Instead Everton will tomorrow look, respectively, Jordan Pickford, Cuco Martina, Leighton Baines, Michael Keane, Morgan Schneiderlin, Davy Klaasen, Gylfi Sigurdsson and Wayne Rooney. Not only is the options available to the Blues tomorrow more star studded, but it should make for a more competitive match than the 4-0 defeat suffered last time. Chelsea have wobbled on their first home game of the season, falling victim to a hard working Burnley side, 3-2. Having seen the way Burnley went about it, Ronald Koeman will be keen to progress through the game with a lead. As Burnley did, this will create pressure and build up nervous energy coming from the fans. The home side will have the benefit of Gary Cahill rejoining their defensive line, after a red card on the first game of the season seen him miss Chelsea’s victory over Tottenham last weekend. Undoubtedly, Everton will have targeted to 3 points against either Man.city or Chelsea in these two fixture. Being able to match these teams with the newly added quality to the side is important. But, to beat a ‘top 4’ team proves just how capable Everton could now be as an outfit. Catch LIVE updates on our Facebook page from 1:30pm GMT.